I’ve been thinking about this post for bit. Dr. Clark Quinn has been thinking along similar lines, from a different angle at his Learnlets blog (http://blog.learnlets.com/?p=2822). This post is about lexicons. What we call things, what these labels mean, and how these labels lose their meaning when folks develop a tendency to apply the same label to everything. Yes, courses, I’m picking on you again. Or am I? These junior teammates were often involved in tasks away from operations and didn’t have the opportunity to orient to equipment and platforms while qualifying in other areas or performing entry level tasks. The orientations helped these members maintain a sense of connection with meaningful operational tasks and the bigger picture. An independent opportunity to study and orient to the basics of a platform stokes confidence to ask better questions when interacting with experienced teammates. I used quotes around “course” above because I think the classification of solutions described above are not courses at all. This might seem like a petty labeling nitpick. But it seems important, if not critical, to reconcile the performance solutions lexicon around fit, purpose, and characteristics so we don’t pollute one stream with the meaning provided by another. This intersects with solution selection processes as well. Provide examples and demonstrations that show, illustrate, and elaborate concepts, procedures, and processes. Provide opportunities for authentic and contextual practice and feedback. 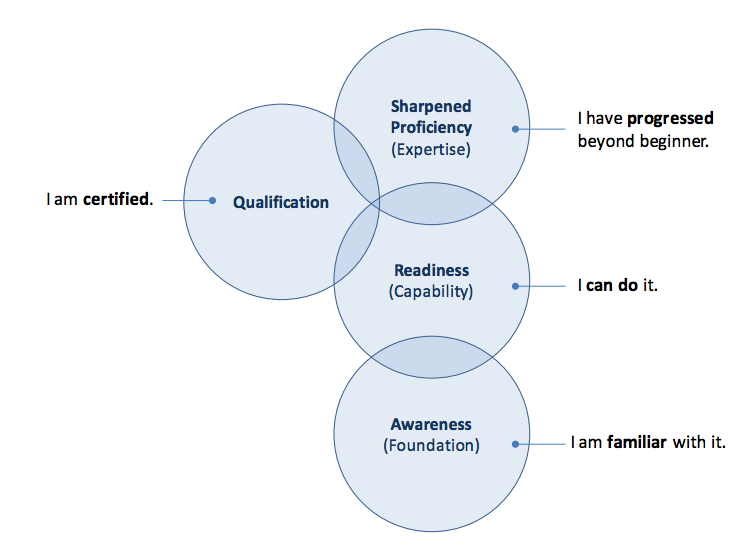 Frame structures of clear progression toward skill goals. How many packages have you seen that take on the course label don’t carry all (or any) of these features? Many? Most? Almost all of the compliance “courses” I’ve had the “pleasure” to participate in didn’t offer any of these characteristics. And this isn’t isolated to online offerings. Many physical classrooms suffer from the same deficiencies. These qualities aren’t elements I’ve made up. Dr. Dave Merrill, Dr. Ruth Colvin Clark and countless others express these qualities as the core principles of effective instruction. Reams of books and studies have been published to support these characteristics as central to success. It’s not uncommon for packaged content to take on the label of a course. To me, a mislabeling can seriously dilute the value and distract from the deliberate services provided by a course of instruction. A lexical hierarchy of solutions that includes courses and other classifications of solution could work together to better define what solutions are, what they do, and how they are selected to match with problem contexts. Heck, this common lexicon could already exist. If you know of a systems lexicon for performance solutions, I’d love to hear about it. I suggest adding a category of solution at the level of awareness called orientation. Orientations have value but they are not courses. Orientations provide foundations for more complex learning structures and support tools. Solutions that aren’t courses have value to the big picture. Orientations, for example, can provide a nudge or boost for task performance when added to performance support. Orientations can also fit well when intentionally situated within course structures. Orientations don’t need to be fancy or expensive to get the job done. We should try to avoid dressing solutions up as objects that they’re not and confusing ourselves as well as the people we provide services for. I’ll be thinking and writing about this more in the future and welcome feedback and advice. In the end, maybe a more clearly and consistently defined set of characteristic definitions and labels for performance solutions wouldn’t be a bad thing. Previous Previous post: Life should be defined by what we are for, not what we are against.